I recently gave a short talk at a seminar for my local IIBA local chapter, in which I argued, as usual, that there’s no such thing as a requirement. In the Q&A, one audience member commented that he works in banking, and is often subject to regulatory requirements which, if not implemented, could be considered a criminal offence, and could theoretically land the company directors in jail. Therefore, in certain circumstances, he argued, there is such thing as a requirement. Now, the theoretical counter-argument here is that even a regulatory requirement is not really a requirement – the company directors could make a conscious decision to ignore the “requirement” and risk imprisonment. Don’t get me wrong, I’m not advocating or encouraging illegal activity, but it is theoretically an option, and one perhaps to consider risking if all the alternatives look worse than taking the risk (certain bankruptcy, for example). The answer I actually gave at the seminar wasn’t quite as extreme as that, because I didn’t want to get laughed off the stage. What I said was that I can imagine companies might choose to sail very close to the wind when it comes to regulatory “requirements”, especially where there is an element of ambiguity in said regulations. Companies might choose to interpret the regulations in such a way as to minimise any negative impacts. In so doing, they need to weigh up the risks – for example negative publicity. However, there are couple of better examples that have occurred to me since the seminar, which I wish I had thought of at the time. 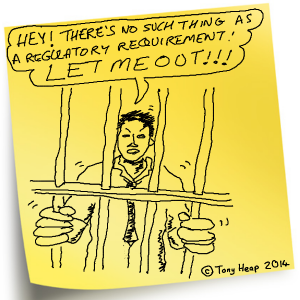 So here are two strategies for avoiding regulatory “requirements”. There have been a few high profile cases recently in the UK of global companies avoiding paying UK corporation tax (Amazon and Starbucks being two that spring to mind). The way they have done this is to ensure their UK business has made no profit, essentially by running the profit-making parts of the business overseas. This is perfectly legal but, of course, it hasn’t gone down too well with the UK public once the newspapers got hold of it. Now I actually don’t know why this company has changed its strategy, but it’s possible that they have done it, at least in part, to avoid the burden of the numerous regulations to which UK banks are subjected. Perhaps there was a tipping point, some new regulatory requirement that made them decide enough was enough, and it was in fact better to relinquish their status as a bank. So for them, the “requirement” was in fact not a requirement after all, and nobody had to go to jail either! The above strategies both challenge some aspect of the condition. Strategy 1 challenges the in the UK part, and strategy 2 challenges the operate as a bank part. Both of them involve some fairly fundamental lateral thinking regarding how the business operates. You might argue that such big decisions would never be taken by a lowly business analyst. But never say never. As a BA, there’s nothing to be lost (and everything to be gained) by throwing in the odd curveball alternative when presenting options for delivering against a “requirement”. This entry was posted in Articles on March 24, 2014 by Tony Heap. I’ve previously stated that I agree with your view that it’s all design and that there is no such thing as a requirement. Your views on alternative ways to respond to industry regulations is interesting and useful and drives a broader view on the matter. I just felt that it detracted from a key message you carry in that the distinction between a requirement and a design is artificial. 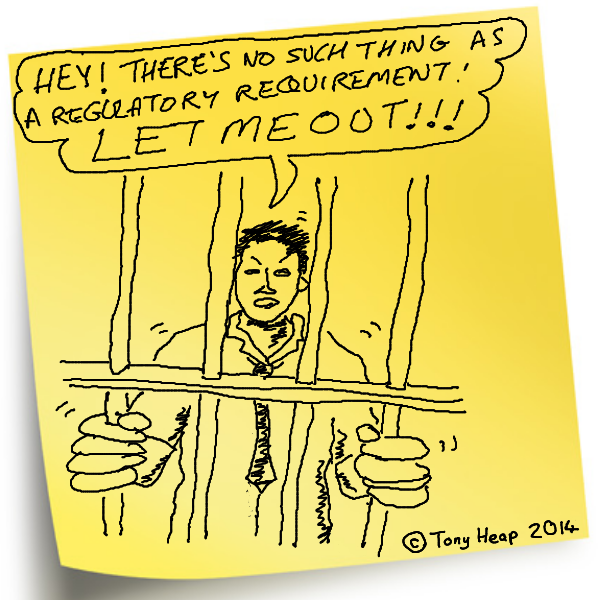 Even if a company is forced to , or chooses to, comply with a regulatory “requirement” in order to stay in business, it should still be stressed that the “requirement” is still a solution design to a higher level problem when viewed from the regulatory authority’s perspective. It’s effectively a design constraint that is passed down to the organisations which needs to further interpret and implement it in their lower level designs.